The parliamentary confirmation hearings of seven minister nominees kicked off Monday, heralding yet another round of political wrangling. 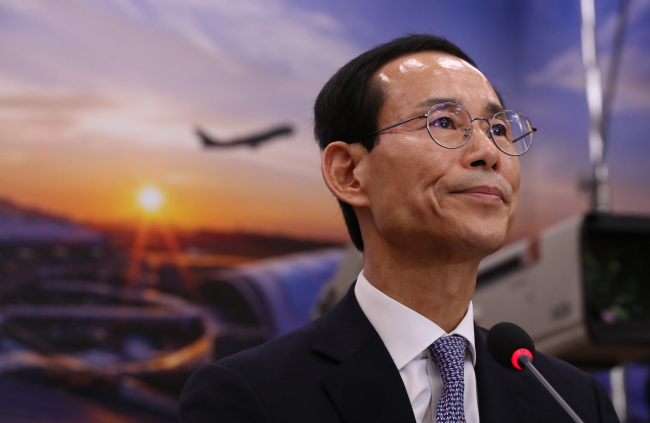 The latest confirmation hearings began with one for Choi Jeong-ho, who has been nominated to lead the Ministry of Land, Infrastructure and Transport. As with most, if not all, confirmation hearings for Cabinet nominees, the opposition’s attacks focused on Choi’s personal affairs. Choi, who rose to the rank of vice minister at the ministry before serving as deputy governor of North Jeolla Province, drew heavy fire from the opposition bloc over suspected real estate speculation. After his nomination, it was revealed that Choi owned two apartments -- one in southern Seoul and one in Seongnam, Gyeonggi Province -- and held the rights to purchase another in Sejong. With the properties having gained more than $2 million in value since he acquired them, the main opposition Liberty Korea Party has accused him of real estate speculation. Just before the nomination was announced, however, Choi transferred the rights to the Seongnam property to his daughter, fueling accusations that the move was an attempt to avoid criticism. It is likely that the Liberty Korea Party will only step up its attacks on Moon’s nominees at subsequent confirmation hearings. On Tuesday, Kim Yeon-chul, Moon Seong-hyeok and Park Yang-woo will take the hot seat. Kim Yeon-chul is currently the head of the Korea Institute for National Unification, and Moon and Park are academics specializing in port economics and art management, respectively. Kim Yeon-chul is up for the seat of unification minister, Moon for the top post at the Ministry of Oceans and Fisheries, and Park to head the Ministry of Culture, Sports and Tourism. The hearings on the two academics, while not uncontested by the opposition, are likely to be overshadowed by the one for Kim Yeon-chul. Park Wang-ja was a South Korean tourist who was shot dead by a North Korean soldier while on a trip to the Kumgangsan resort. On Wednesday, Reps. Chin Young and Park Young-sun of the ruling Democratic Party will respectively be vetted for the posts of minister of interior and safety and minister of SMEs and startups. Cho Dong-ho, the minister of science and ICT nominee, will also be grilled by lawmakers on the same day. From the outset, Moon’s nominations drew heavy fire from the opposition bloc, which said the Cabinet reshuffle had more to do with next year’s general elections than any concern with running state affairs efficiently. Of the seven ministers slated to be replaced, four are incumbent lawmakers likely to run in next year’s general elections. The concerned ministers are Interior Minister Kim Boo-kyum, Transport Minister Kim Hyun-mee, Culture Minister Do Jong-hwan and Fisheries Minister Kim Young-choon. Kim Boo-kyum, currently in his fourth parliamentary term, is considered a major player within the ruling bloc in a future presidential race. The other two Kims are third-term lawmakers, while Do is serving his second term. Despite the relatively easy confirmation hearings that normally greet incumbent lawmakers picked for the Cabinet, the situation appears different this time around with Park Young-sun reported to be among the Liberty Korea Party’s main targets. The main opposition party has already raised allegations of late tax payments, and possible irregularities concerning her son’s education. The party has also claimed that the lawmaker is attempting to sabotage the confirmation hearing process by refusing to provide information it requested. According to the party, Park Young-sun refused to answer a large number of questions, citing privacy issues, and refused to provide nearly half the requested documents.